The 2013 iteration of IDEAS CITY, the biennial festival created to explore the future city and to effect change, will take place in downtown New York from May 1-4, 2013. The theme for IDEAS CITY 2013 is Untapped Capital. As the world's resources continue to be endangered, depleted, and destroyed, we all need to imagine new solutions and develop innovative approaches and practices. Rather than focusing on deficits, IDEAS CITY 2013 will encourage intensive examination of surplus resources that may be under-recognized or underutilized: Untapped Capital. There are many ways of thinking about what might define "untapped capital," ranging from people and raw materials, to ideas, networks, varied resources, and modes of communication. The topic of Untapped Capital provides a touchstone for alternative thinking about new methodologies, new solutions, and new goals. 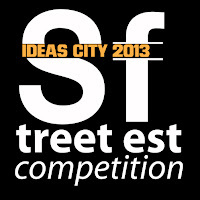 For the occasion of the 2013 IDEAS CITY, Storefront for Art and Architecture jointly with the New Museum and Architizer are launching the StreetFest competition for the design, management, and construction of temporary outdoor spaces that produce new ways for collective gathering and city engagement. On Saturday, May 4, 2013, one winning entry will occupy designated outdoor space along the Bowery near the New Museum during the StreetFest. They envision fabricating a minimum of ten structures that will cover approximately 1000-1500 square feet. These temporary outdoor structures will accommodate a multiplicity of activities including: vendors, workshop areas, outdoor classrooms, demonstrations, installations, music, and other performances and exhibitions.